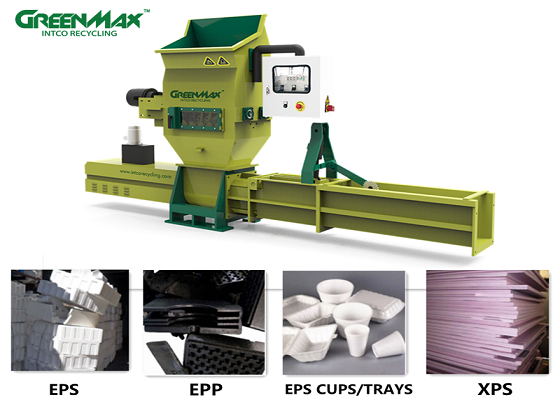 GREENMAX APOLO C200 Styrofoam recycling machine works with cold compressing technology, it can screw the waste foam into small piece and then compress it out. It reduces the foam volume at a ratio of 50:1, the working process is safe and efficient. APOLO series compactor compacts the waste Styrofoam waste quickly and tightly. The large amounts of waste Styrofoam transported there in truck are effectively processed. And thanks to the high density gaining by Styrofoam compactor, the Styrofoam blocks can save much space than those without compaction. Then the recyclers can do their Styrofoam recycling business more easily and profitably.